As you see your landscaping plan become a reality, don’t forget about grading the area. Grading ensures that existing drainage patterns are recognized and preserved, and also that no draining problems are created through the alterations made during the landscaping process. With the help of a professional landscaping team, like that at Vision Green, you can build and landscape your property while ensuring that the flow of surface runoff and retention is directed properly. Vision Green offers landscape grading and excavation serviced to ensure your project is properly planned and executed. Grading is a process that removes, adds or relocates material, typically dirt or rock, to make the land ready for a particular purpose or to ensure water properly runs off the land. Grading often includes leveling a well as excavation of the area to improve drainage and provide a foundation for a new structure. Do you need grading in your yard? If water does not drain properly away from your home or pools in an unwanted area of your yard, the you do. Also, if you are going to build a new structure or add a new landscaping element to your yard, you need to ensure the land is ready and the new structure will not impede the flow. If you are not sure, Vision Green will be happy to provide you with insight into whether or not you need landscape grading services. Sculpt the landscaping to ensure your gardens are as beautiful and accessible as possible. Ensure that your home’s exterior looks and functions exactly how you need and want. If you think your home or business could benefit from landscape grading, Vision Green has the tools and knowledge to do the job for you. 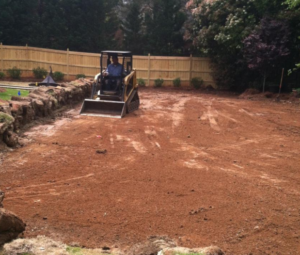 Contact Vision Green to discuss your grading needs, and learn more about how you can protect your landscaping and your yard with our landscape grading and excavation services.